Our Funarena! : Now Showing: The Greatest Fasting Spectacle On Earth! Now Showing: The Greatest Fasting Spectacle On Earth! Anna Hazare was arrested early morning yesterday and was reportedly allowed to go free by evening. But since then, Anna Hazare has been refusing to leave Tihar Jail, Delhi that has meantime become a tourist spot globally. Apart from people of all walks of life having an electrifying time out there bestowed with generous attention by the ecstatic news channels 24 hours a day, famed spiritualists, self styled saints babas sadhus and what not have congregated there to mediate and convince Anna that the jail was not a very healthy place to live in for long and that too inhabited by very embodiments of corruption he was fighting against.Even the harassed jailors politely asked Anna to leave as soon as possible. But Anna is not convinced at all. He wants to fast unto death wherever he is and will leave only if he is allowed to carry on at a prime venue of the national capital. The problem does not stop there as the question of how long to fast is the basic issue. The hapless government offers him the same venue where the fraud Baba staged his antics leading to a controversial endgame only recently and also offers him 7 to 10 days of splendid fasting. One channel citing sources said that Team Anna was more or less agreeing to that, but some member did not agree, wanting at least a month. So, now the fight of 'Our Bill' Vs 'Your Bill' has transformed into 'Our Conditions' Vs 'Your Conditions'! Extraordinary! People fight hard for food while these noble souls are fighting to fast! We tend to see a plot there if we think like a commercial formula film producer. You obviously know the impact of a sympathy wave if you create tragic conflicts tension and drama. Now, with Anna languishing in a jail is some sympathy and he out of jail is no sympathy unless he goes empty stomach for as many days as possible-at least a month. 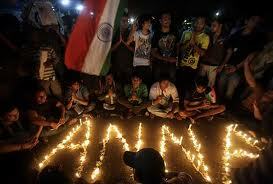 Civil society members who have become global celebrities thanks to Anna just cannot afford to let go. The greatest fasting show of the world must be continued at all costs. The question is how the government failed to anticipate this plot and walked straight into the trap watched gleefully by the opposition political parties. While the government is having the worst of both worlds, the opposition is devouring the cake and the pudding too! If corruption was a man of flesh and blood he would have already laughed himself to death setting free the wonder that is India completely! What? Did someone utter 'Lokpal Bill'? Well, we completely forgot about it! Anyway, what was that? If you know kindly spread the knowledge among the captive crowds littering streets and campuses in many parts of the country day and night chanting only 'Anna', 'Anna'!